The peal of 5,024 Rothbury Surprise Major (see Belboard website) took 3 hours and 16 minutes which surprised me as I expected three hours ish . Picture attached shows the band minus one who, shot off. Ladies from church decided to put on soup, cakes, tea etc for those who were in the village to listen. When the band emerged form the Tower they were applauded into the adjacent Parish Hall and fed with soup, cake, teas for which they contributed. Visitors from outside the valley came to listen and one local asked if we could arrange a similar event every week please as they were enjoying the ringing so much. The selling of refreshments added another £240 to the church funds as well as generating enthusiasm in the village. Hence the grand total contributed to church funds was £160 as the top bid, plus a £50 donation, plus £240 from the catering total £450 plus a lot of local goodwill. Early in 1893 before the installation of the present Ring, a bell was removed from the bell loft. 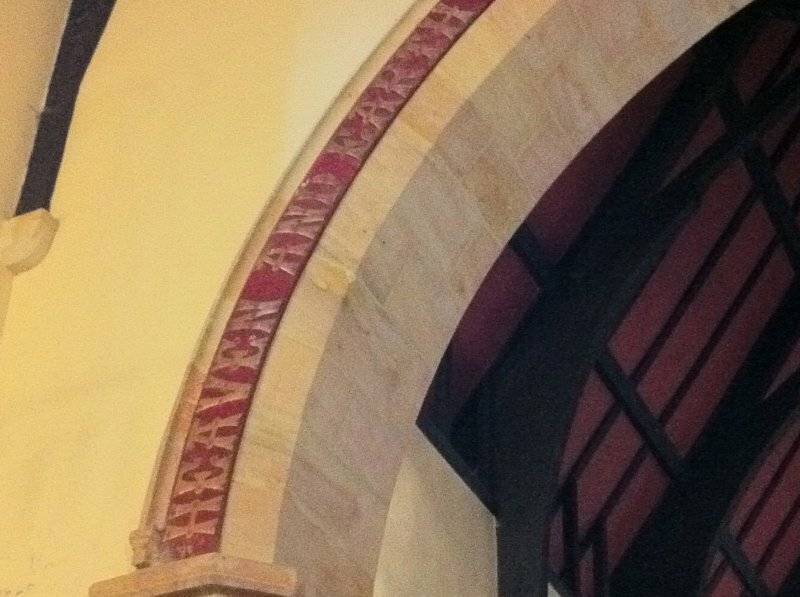 It carries the inscription “John Thomlinson, Rector of Rothbury 1682” and its founders mark. The mark, three bells in a circle of leaves confirm it as the work of John Bartlett of the Whitechapel Bell Foundry. The 1893 Ring were the most generous gift of a single benefactor who was over 80 years of age when she had the ring cast and installed at Rothbury. Whilst spending Christmas in Rothbury Miss Mary Dawson stayed at Well Care House and decided to do something to benefit Rothbury and in memory of her late brother William Dawson who died at Thropton Hill. She contacted Whitechapel Bell Founders who were Mears and Stainbank at that time. They agreed to cast and install eight bells and have them ringing for Easter 1893. “First a floor and sufficient beams 4 in number, best oak, 2 of 15 inches by 10, and 2 of 15 by 8, upon this rests the flooring dials 2 1/2 inches thick, and below them for the ceiling1 inch dials. Between them is placed 3 inches of mortar to deaden the sound in the belfry. The walls were neatly plastered down, painted at the bottom with a dado. Lights were provided and windows to open. 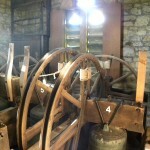 An extra floor was provided to the Belfry with felt to deaden the noise into the Church. Miss Dawson also provided matting, 2 forms, six chairs, table and clock, doing at her sole expense all that was necessary to strengthen and improve the Tower, and give ample comfort to the Ringers. Mr Wake undertook the Marm’s work with the difficult task of raising and fixing the 4 New Oak Beams, which was all done without a hitch. Messrs Grey and Son did the joinery work most carefully, while Mr Hood did the plastering, Mr N Mackay the plumbing, and Mr F Roper the painting and felting. 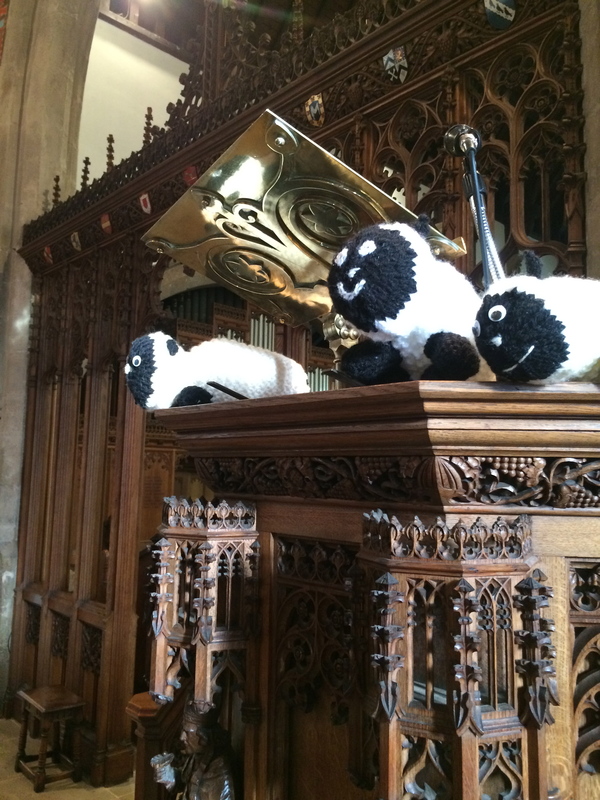 The work was all finished ready for the Bells when they arrived on March 17th. They were hoisted on Wednesday March 22nd , in the presence of Miss Dawson and a large assembly of the Public without a hitch. The oak frame and fittings were sent on March 4th and Mr Vincent, the firm’s fitter, at once proceeded with his part of the work, much valuable aid being rendered by Mr G N Grey and his father. To this day the ring remains original. Apart from regular maintenance, the only work done since 1893 has been the installation of ball bearings and the periodic replacement of the pulleys which guide the bell ropes. Doctor Barrow the local doctor had overseen the work on behalf of Miss Dawson and he then took over the further training of the band. They were able to ring rounds immediately but method ringing on six soon followed and by November 1893 the band were able to ring Triples (i.e. method ringing on 7 with a cover bell). 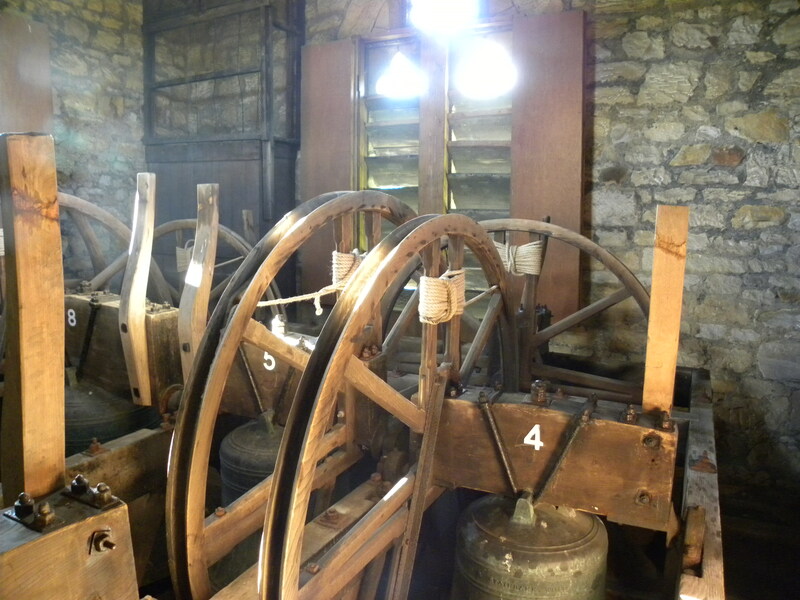 However only four years after the dedication of the bells the treble bell had to be raised and re-hung on a steel platform above the original oak frame to accommodate the chiming hammer for the hours onto the tenor bell. The Church Clock was installed to celebrate the Diamond Jubilee of Queen Victoria in 1897 with funds raised by public subscription. 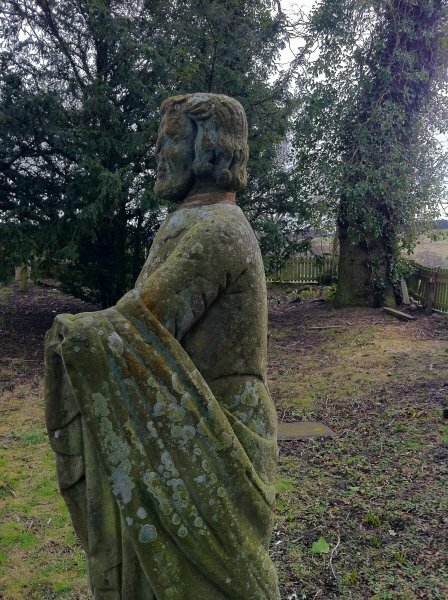 Rector of Rothbury the Rev. Canon Young conducted a special service by the West door of the Church on Sunday June 27th 1897 to mark the setting in motion of the new clock and the first chimes heard were of the four quarter chimes for the hour followed by three blows of the tenor marking 3 pm. The Rothbury Guild of Ringers Record Book has been copied by the County Public Records Office at Woodhorn, but the original remains in use to this day. Its records are full and complete from 1893 until the outbreak of the Second World War in 1939. Spasmodic entries are then found until 1974 by which time the bells were generally silent. 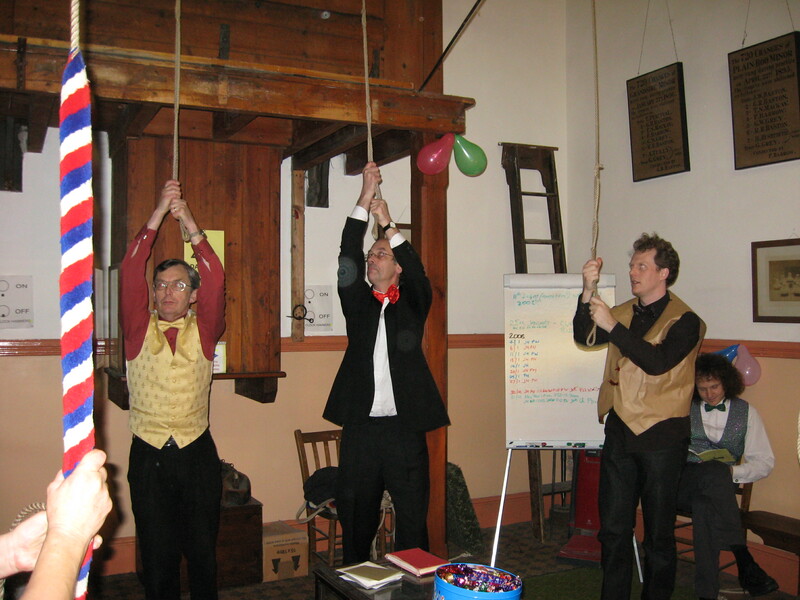 During the Church Stewardship Mission in 1985, the Church Youth Group suggested to the Rector that as their contribution they would like to learn to ring the bells and ring for services again. 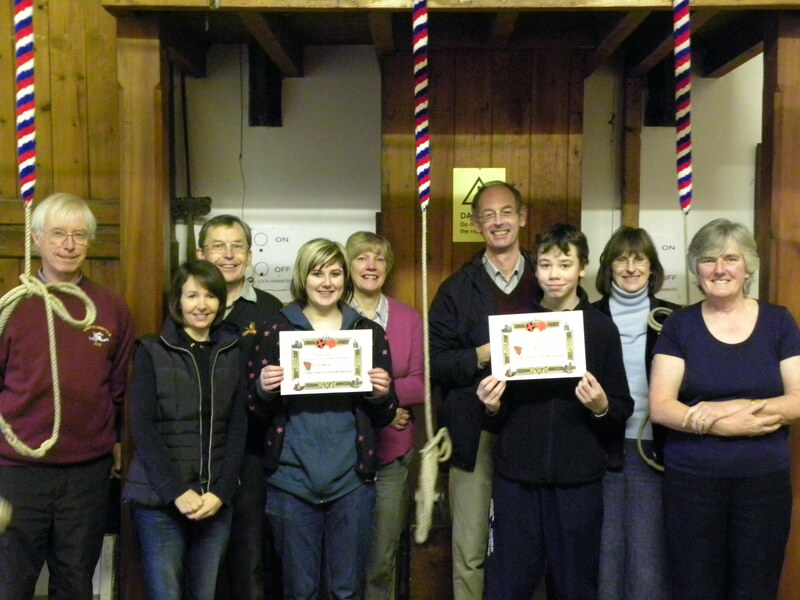 Colin Wheeler from Morpeth Clock Tower Bell Ringers was contacted and on Friday July 12th 1985 he, his son Patrick, and Ron and Sue Hanson from Embleton started to teach bell handling to a dozen potential ringers. Terry Williams from Morpeth soon joined the teachers, rapid progress was made and the new band were able to ring rounds during the practice night of Friday 13th September 1985 and for the Harvest Festival Service on 6th October. On Friday 1st November 1985 after the ringing practice the Rothbury Ringers and Rector entertained their tutors to a “Dawson Style” evening at the Queens Head. The band thrived with the support of Rector Francis Eddershaw who joined the practice nights most months and supported ringing social events. Peals rung have been few and only when a major local or national event takes place. Consequently only two have been rung recently the first for the bicentenary of Lord Armstrong and the second at the beginning of June 2012 to mark the beginning of the Village’s Celebrations for the Diamond Jubilee of Queen Elizabeth 2nd. During the last few years’ service-ringing has matured to regularly include triples and occasionally major. Since 2010 the local band has included around 18 active members. 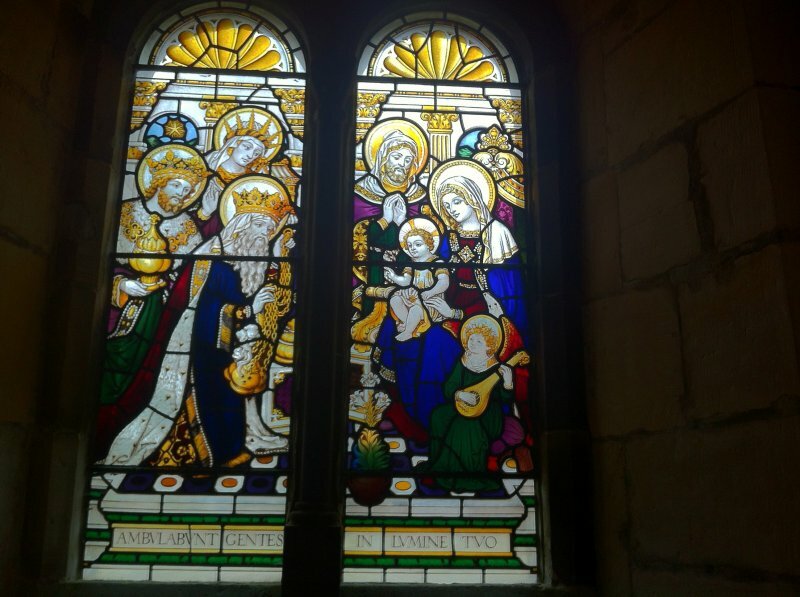 Practice night in Rothbury takes place between 7 pm and 8-30 pm each Friday evening. Small numbers of non-ringing visitors (or as we prefer to call them, those who don’t ring yet!) are welcome to come and watch but are requested not to enter the Ringing Room whilst ringing is taking place. Ringing for local weddings is always a pleasant duty and couples are invited to visit the Tower and watch the ringing before their big day. (For details of the ringing offered for your wedding see also our “Wedding Ringing Sheet”). The village reaction on wedding days is always supportive with those who can, coming to the church to watch the couple arrive and later emerge after the ceremony. 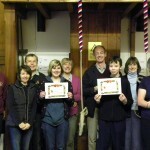 Indeed todays Rothbury Ringers are grateful for the support of not only Church people, but the village as a whole. 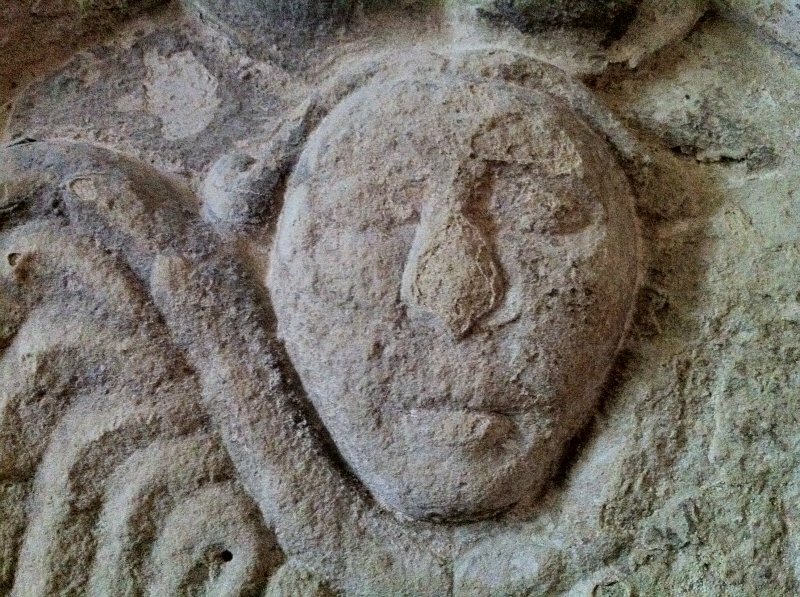 Individual ringers who ring elsewhere are always welcome to the practices which continue throughout the year, including the summer. Groups are requested to e-mail or telephone in advance so that sessions are not over-subscribed. We are pleased to arrange visits for local groups and interested local visitors will be offered the chance to try ringing single strokes on a silenced bell; albeit with the warning that bell ringing can become addictive! The Bells are rung every Sunday morning from 0930 hours for the 10-15 morning service and for other services and special events by arrangement. Ceilidh Dances, outings and an annual Mary Dawson Dinner held each April (in memory of the benefactor who provided us with the bells) are regular annual events. 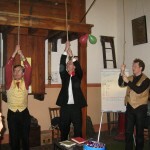 New Year’s Eve is properly marked with Gentlemen Ringers directed to wear waistcoats and bow ties to mark the occasion. This usually follows an evening of relative sobriety until after the ringing for midnight. On New Year’s Day a quarter-peal is usually attempted often in competition with the local Highland Pipe Band!